Deborah's passion is to help her clients physically shed muscle/tissue tension and pain, as well as help balance and cleanse the human energy field—specifically the chakras and aura—being mindful of meridians, accupoints, and bio-rhythms. A normal session consists of a combination of Swedish massage, energy work and cranio-sacral. She is also able to provide deep tissue, cupping, and trigger-point therapy upon request. Deborah believes that by using the combination of these modalities she is empowering her clients with the ability to reclaim their own wellness—body, mind and spirit. Deborah is a Port Townsend School of Massage graduate of 2009. She gained experience working with injury clients while employed at Sorenson Chiropractic in Sequim. She also worked at Frenchys Day Spa in Seattle and with residents at Seaport Landing Assisted Living and Retirement Center. Deborah's experience with energy healing began with Reiki and evolved into 21st Century Energy Healing with Master Teacher and author Deborah King. She is also a student of Michael Maskornick a Cranio Release & Balance Teacher and Practioner of Bellingham. Deborah enjoys outdoor activities such as beach walks, boating, camping, hiking, & gardening. Solitude and study are also important to her well being. 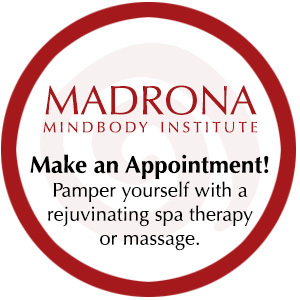 Call 360-344-4475 or email info@madronamindbody.com to schedule your appointment. Gift certificates available. Cash, credit cards, and checks are accepted. Purchase a gift certificate online HERE. ~ Fabulous work after a severe head trauma. The universe gifted me with winning the August drawing of a massage at Madrona Mind Body. What a great surprise to have a cranial sacral appointment with Debra Wood. I feel better today as a result of Deborah’s healing touch. ~ C.
~R. was very pleased with his massage. His back muscles relaxed enough to relieve the worst of his pain.